Synthesis of glycogen from glucose is called glycogenesis. Glycogen is the major storage form of glucose in our body that is reserved for future use. Glycogenesis mainly occurs in the liver and skeletal muscle. It takes part in the cytoplasm of cells, and requires energy supplied by adenosine triphosphate (ATP) and uridine triphosphate (UTP). In liver, glycogenesis occurs during periods when body has been well fed. In skeletal muscle, glycogenesis occurs during at rest. Before going to steps of glycogenesis, we should know about the glycogen structure. Glycogen is a highly branched-chain made from α-D-glucose. An α(1→4) linkase is the primary glycosidic bond of glycogen. There is a branch containing an α(1→6) linkase is also present after about eight to ten glucosyl residues. At first step of glycogenesis, glucose is phosphorylated to glucose 6-phosphate, catalyzed by glucokinase in liver and hexokinase in muscle. At second step, glucose 6-phosphate is isomerized to glucose 1-phosphate, catalyzed by phosphoglucomutase. Next, glucose 1-phosphate reacts with UTP (uridine triphosphate), and form active nucleotide UDP-glucose (uridine diphosphate glucose) and pyrophosphate, catalyzed by UDP-glucose pyrophosphatase. 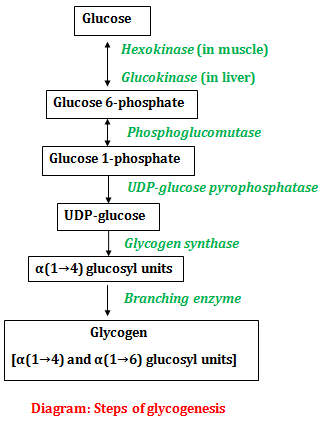 Finally, glycogen synthase enzyme catalyzes the synthesis of a glycoside bond between C1 of the glucose of UDP-glucose and C4 of a terminal glucose residue of glycogen, liberating UDP (uridine diphosphate). A preexisting fragment of glycogen must be present to initiate this reaction. In the absence of glycogen fragment, a protein primer known as glycogenin, can initiate this reaction. Glycogenin is glucosylated on a specific tyrosine residue by UDP-glucose. Further glucose residues are attached in the α(1→4) position to form a short chain. This short chain of glycogen serves as an acceptor of future glucose residues, so that the branches of glycogen molecule become elongated as successive α(1→4) linkases are formed. When a chain is at least eleven glucose residues long, branching enzyme transfer a part of an α(1→4) chain to a neighboring chain to form an α(1→6) linkase, establishing a branch point. The branches increase by further additions of α(1→4) glucosyl units and further branching. Regulation of glycogenesis is accomplished on two levels such as allosteric regulation and hormonal regulation. 1) Insulin – Insulin stimulates glycogenesis by stimulating Glycogen synthase enzyme activity. 2) Glucagon and epinephrine – Glucagon and epinephrine inhibit glycogenesis by inhibiting Glycogen synthase enzyme activity.